Al Nagler eagerly pushed Ethos designer Paul Dellechiaie to extend the new 3.7mm focal length to reach 110°, the same field size as the LEM Simulator optics Al designed 45-years ago to train NASA astronauts for lunar landings. The new 4.7mm Ethos-SX, like its 3.7mm progenitor, is designed and crafted to combine its exceedingly wide field of view with all the contrast, color-rendition, distortion correction and center-to-edge sharpness needed to achieve that natural view. Compared to a lower power eyepiece with the equivalent TFOV (similar field stop) such as an 11mm Plossl (9.1mm field stop), the greater power - for higher resolution, and smaller exit pupil (for a darker background to enhance contrast) reveals a deep sky experience "even better than you imagined". 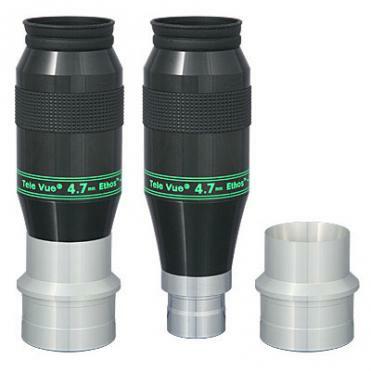 The 4.7mm is a 1.25" format and is parfocal with the wide range of 1.25" Tele Vue eyepieces. 2" adapter included. Barrel Size (in.) - 2" and 1.25"